Hamburg, Germany — January 8, 2015 — Hamburg University of Technology (TUHH) today announced that it has been named a CUDA® Research Center by NVIDIA, the world leader in visual computing. CUDA Research Centers are institutions that embrace and utilize GPU-accelerated computing across multiple research fields, and are at the forefront of some of the world’s most innovative and important scientific research. 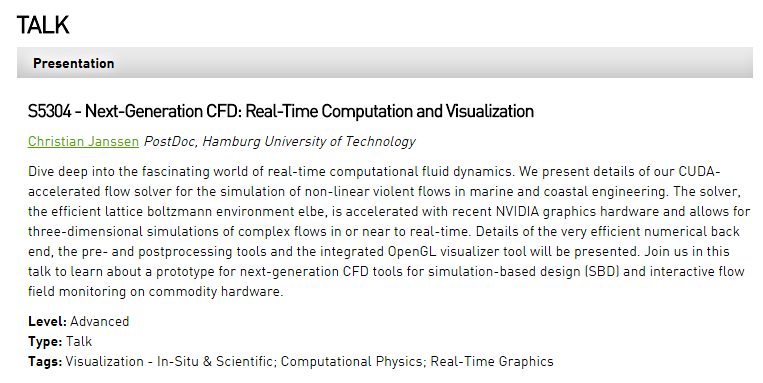 Hamburg University of Technology (TUHH) was recognized for its advanced research in computational fluid dynamics at the Institute for Fluid Dynamics and Ship Theory using GPU accelerators. Emphasis is put on Lattice Boltzmann simulations of two-phase flows in conjunction with dynamic overset grids for multiple floating bodies. Applications are primarily marine and ocean engineering oriented, e.g. 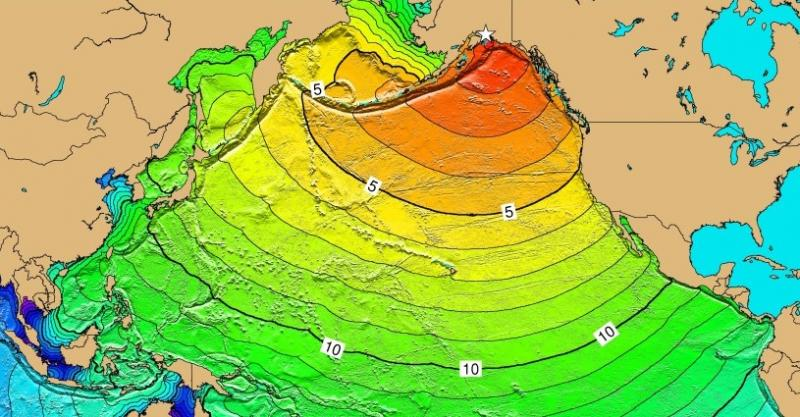 simulation based early Tsunami warning systems or ice-going ship operations. Supercomputing on the Desktop offers a new arena for the application of simulation based sciences to a broad range of future challenges, and might have a substantial social and economic impact, says Prof. Garabed Antranikian, President of the TUHH. This designation recognizes the excellence of TUHH at the scientific interplay between engineering, computer science and applied mathematics. Research is aiming at near real-time simulations and online data exploration using GPU accelerator technology to derive next generation kinetic flow solvers. The vision of the Computational Fluid Dynamics team is to participate in the paradigm shift from traditional mainframes towards office supercomputing. As a CUDA Research Center, TUHH will have pre-release access to NVIDIA GPU hardware and software, the opportunity to attend exclusive events with key researchers and academics, a designated NVIDIA technical liaison, and access to specialized online and in-person training sessions. Hamburg University of Technology (TUHH) is one of Germany’s youngest and most successful research driven universities. Plans for a university of technology in the Süderelbe area of Hamburg go back to the 1920s. Fifty years later, in 1978, the Hamburg University of Technology came into being. Now, the TUHH has around 100 professors and 1,150 employees. 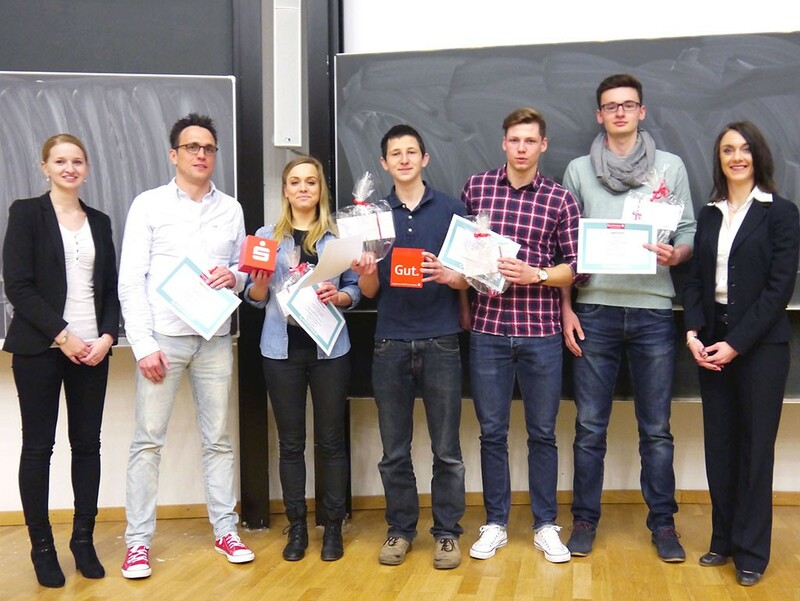 TUHH is a competitive entrepreneurial university focussing on high-level performance and high quality standards. It is dedicated to the principles of Humboldt (unity of research and education) and aims at excellence at the international level in its strategic engineering research fields. The CUDA Research Center at TUHH is associated with the Institute for Fluid Dynamics and Ship Theory (FDS) and the CUDA-accelerated flow solver elbe. This entry was posted in elbe on January 8, 2015 by Powerkiter. My GTC 2015 talk has been accepted, see you at GTC 2015, March 17–20, San Jose, California. 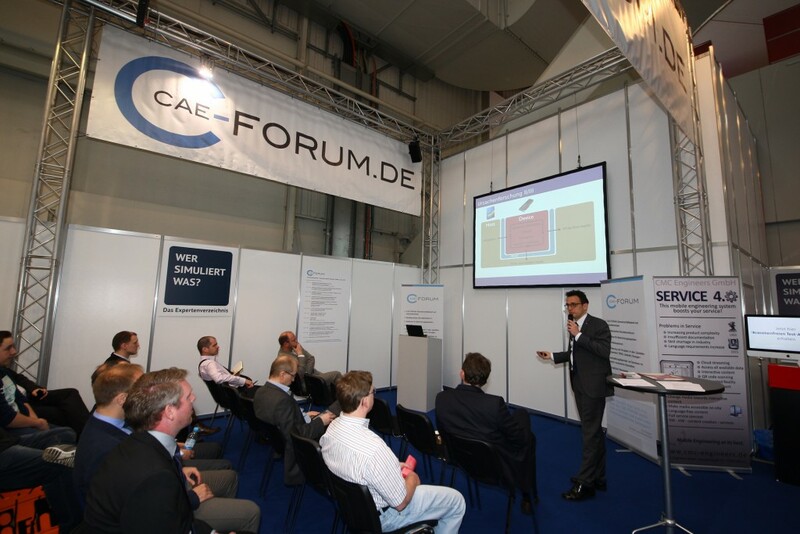 This entry was posted in Conferences, elbe, Talks on December 4, 2014 by Powerkiter. 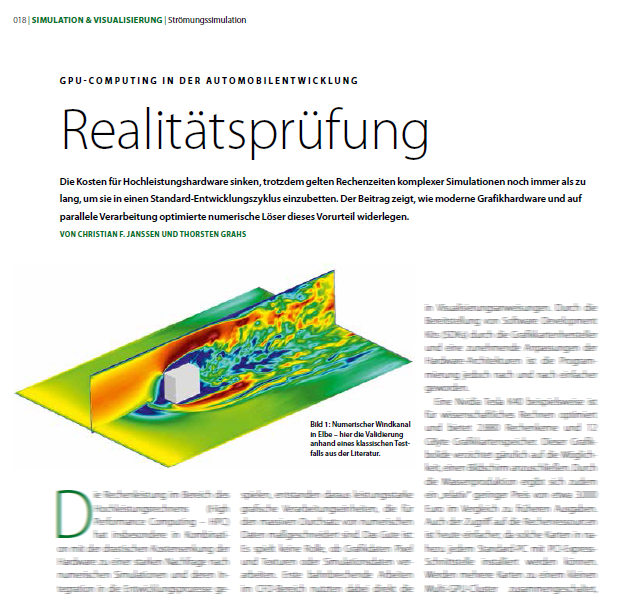 Unser Beitrag zum Einsatz von Grafikkartenhardware im automobilen Entwurfsprozess im DIGITAL ENGINEERING Magazin ist jetzt erschienen. This entry was posted in elbe on November 29, 2014 by Powerkiter. 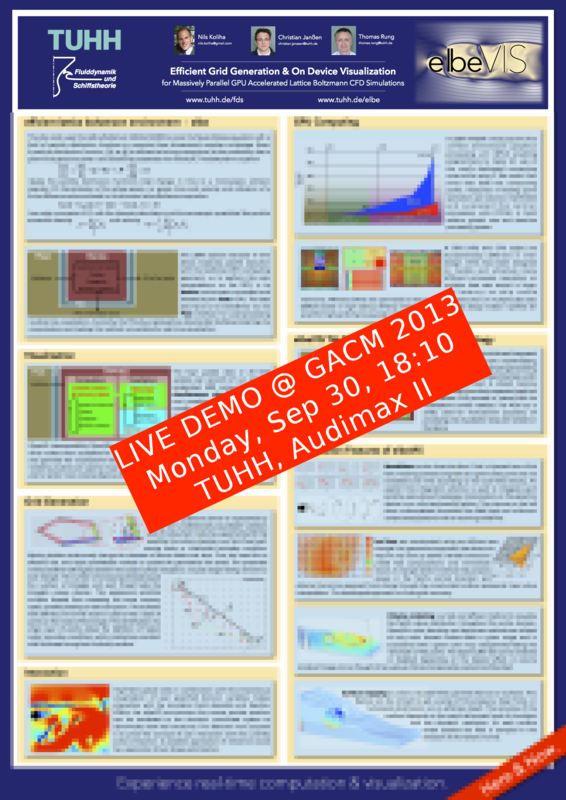 We recently tested and implemented a grid refinement strategy in the LBM solver elbe. First, the concept was tested in the two-dimensional singlephase module elbeSP2D. The velocity field of a 2D Karman Vortex Street at Re 500 is shown below. 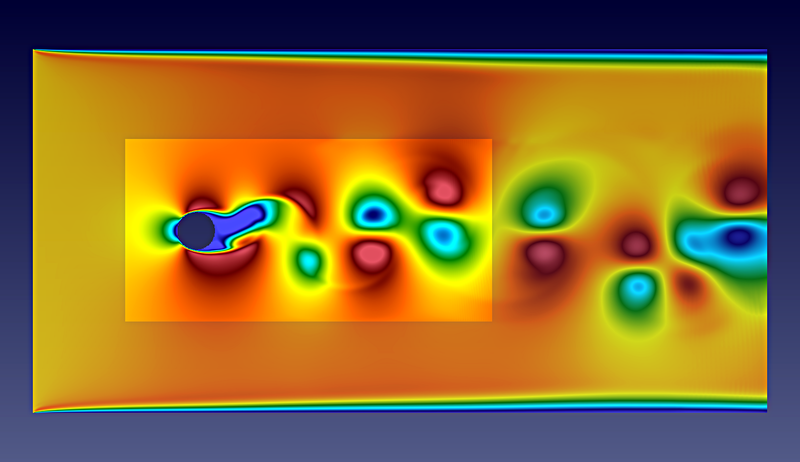 After a proper validation of the grid coupling, the interpolation routines will be included in all the remaining elbe modules, including those for free surface and multiphase flows. This entry was posted in elbe on October 24, 2013 by Powerkiter.